His clients included President John F. Kennedy and President Boris N. Yeltsin of Russia. The cause was complications of prostate cancer and AlzheimerÕs disease, his daughter Martha Cownap said. He worked for John F. KennedyÕs presidential campaign in 1960 and Lyndon B. JohnsonÕs in 1964, and helped Vice President Hubert H. Humphrey stage an 11th-hour comeback that almost put him in the White House in 1968. In both races, Mr. NapolitanÕs use of weekly polls to fine-tune his candidatesÕ media messaging, almost unheard-of at the time, was considered decisive. In 1968, Mr. Napolitan was handling races in five states when, late in the campaign season, he was asked to take on a sixth job: to help rescue Mr. HumphreyÕs sputtering presidential campaign. At the time, Mr. Humphrey, a Democrat, was trailing the Republican nominee, Richard M. Nixon, by 15 points. Placed in charge of media strategy, Mr. Napolitan fired the campaignÕs high-priced advertising agency, commissioned a raft of polls and a spate of new ads, and sent a camera crew out on the campaign trail with Mr. Humphrey to make a half-hour promotional film about him — another innovation Mr. Napolitan popularized that became a standard element of major campaigns. ÒThat broke my heart for three months,Ó Mr. Napolitan said. 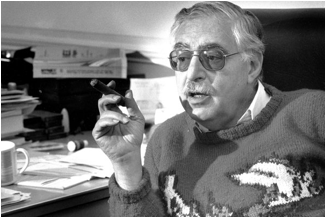 After graduating from American International College in Springfield, Mr. Napolitan worked as a newspaper reporter in that city for 10 years before turning to political consulting. His first client was an underdog candidate for mayor opposing a six-term incumbent. The underdog, Thomas OÕConnor, won. Two years later, Mr. Napolitan helped another candidate unseat Mr. OÕConnor. His political dexterity attracted the attention of Lawrence F. OÕBrien Jr., a fellow Springfield native who was managing the 1960 Kennedy campaign. Mr. OÕBrien, who would later become chairman of the Democratic National Committee and commissioner of the National Basketball Association, made Mr. Napolitan a kind of right-hand man without a portfolio. Mr. OÕBrien told him to come up with a title. He settled on Òpolitical consultant,Ó a term that was not in wide circulation then. Mr. Napolitan and his firm, Joseph Napolitan Associates, went on to advise candidates abroad. With his help, President Ferdinand E. Marcos won re-election in the Philippines in 1969, ValŽry Giscard dÕEstaing won the French presidency in 1974, and îscar Arias became president of Costa Rica in 1986.